St. Paul primary voters signaled St. Paul Mayor Randy Kelly faces a very tough re-election campaign. Kelly advanced to the general election, but voters chose DFL-endorsed candidate Chris Coleman over the incumbent by nearly a 2-1 margin. St. Paul, Minn. — Former City Councilmember Chris Coleman spoke to hundreds of jubilant supporters at his campaign party on Raspberry Island in St. Paul. Coleman was clearly pleased at the news that he received the most votes in the primary. "We would have been happy with a second-place finish, but wow! What a statement that the voters of St. Paul are ready for a change!" he said. Coleman says his campaign for mayor is about making St. Paul better. "We all know St. Paul is doing OK, but we all know it can be doing better. It can be doing better if we listen to people, if we actually care what people have to say about their community. If we say we love St. Paul, we want St. Paul to be the greatest city in the world and we're not going to rest until we get there," he said. Coleman won 51.8 percent of the vote, while mayor Randy Kelly received 26.7 percent of the vote. Turnout was unusually low for St. Paul, at 12 percent. 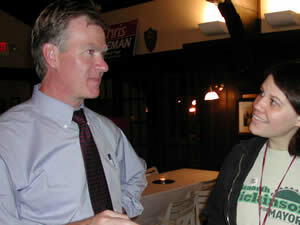 At a much more subdued campaign party across town at Mancini's, Kelly put an optimistic face on his second-place finish. "What happened tonight is exactly what we expected to happen. This is the DFL endorsee's playground," Kelly said. Kelly has always had a strained relationship with his own party. He didn't have the DFL endorsement when he ran four years ago, and the relationship became even more strained when Kelly endorsed Republican George Bush in last year's presidential race. Kelly says he isn't surprised the tension is reflected in the primary results. For $20,000 and eight or 10 weeks that we spent on the campaign, that's pretty incredible to have that kind of turnout. "The diehards are going to go out, they're going to vote. They're going to try to punish you for that. The fact is: in the general election, common-sense people come out and they're going to be judging on what's this guy done, what's he going to do? I feel confident in the people of St. Paul they'll make the right decision in November," Kelly said. Ramsey County election officials say Coleman's 6,000-vote margin over the mayor is unprecedented in a primary election. Still, this isn't exactly new territory for Kelly. When the seat was open four years ago, he finished second in the primary to DFL endorsee Jay Benanav, but went on to win the general election. Another shadow looming over Kelly's marginal showing this year is Green Party candidate Elizabeth Dickinson, who won about 20 percent of the votes cast. Dickinson ran her campaign as the progressive voice for the city. She focused on environmental issues, living wage jobs and corporate responsibility. "We put in a tremendous effort. I mean, for $20,000 and eight or 10 weeks that we spent on the campaign, that's pretty incredible to have that kind of turnout," she said. Dickinson says her strong showing in the primary is clearly sending a message to Kelly and his bid for re-election. "If you put together Chris Coleman's votes and my votes, that tells you something about the general direction that I think St. Paul voters want to see St. Paul go," she said. Dickinson says as a Green Party candidate she will probably not throw her support to either of the two candidates. In the St. Paul school board race, the top three vote-getters -- John Brodrick, Tom Goldstein, and Elona Street-Stewart -- are all DFL-endorsed candidates. They and three others -- Rebecca Williamson, Terry L. Lake, and Lori Windels -- will compete for three seats in the general election in November.